I have had my eye on the original Silverstone Raven RV01 for quite some time. Released in late 2008, the case quickly caught my attention because of its strange orientation that pointed the motherboard upward at a 90-degree angle, so the "rear" I/O panel was placed on top of the enclosure instead of behind. Silverstone dubbed this layout style the "stack effect". The main problem originated in with the RV01's massive dimensions, even for a full tower case, measuring 280mm (W) x 616mm (H) x 660mm (D). By comparison, the recently reviewed Cooler Master HAF X — which we consider to be a very large full tower — measures 230mm (W) x 599mm (H) x 550mm (D), making it considerably smaller. Silverstone didn't necessarily want to make the Raven that large, but ATX motherboards are longer than they are wide 305 x 244 mm (12 x 9.6"). That shape suits standard cases fine, but since the Raven's design mounted the motherboard sideways, it struggled to accommodate everything, making the RV01 about 20% longer than the Cooler Master HAF X. From the front, the Silverstone Raven 2 Evolution (RV02-E) looks much like a mid-tower measuring just 503mm tall. The design is also rather bland compared to many of the high-end computer cases that we've reviewed recently. There are eight 5.25" drive covers which are incorporated into the design with a small Raven logo at the bottom. At the very top is a clear, "V"-shaped band that houses blue power and activity LEDs. Besides this, there's not much happening on the front of the Raven 2 Evolution. It's worth noting that the original Raven design was also quite bland, but it featured more striking lines. It's not the facade that catches your eye with the Raven 2 Evolution anyway, but the case's shape. As we mentioned, looking at the front of the case gives you the impression that this is a mid-tower and not a full tower that is capable of housing multiple high-end graphics cards and almost a dozen storage devices. Measuring 643mm long, The Raven 2 Evolution is best described as a limousine version of a mid-tower. The stretched dimensions are extremely apparent when viewing case from above. Most of the top is covered by a removable lid that provides access to the motherboard's expansion cards, input/output panel and the power supply. The lid is well ventilated as almost all of the air that flows through Raven 2 Evolution exits here with the help of a single 120mm fan. The I/O panel is in front of this and is quite basic by today's standards, featuring just a pair of audio jacks and USB ports, which don't support USB 3.0. The power and reset buttons are located at either side of the I/O panel. The the rear of the Raven 2 Evolution, where you would typically find fans and motherboard connections, has nothing but a single grill with a removable dust cover for the power supply. The right side of the case is covered by a long, free-flowing door, which has a massive case window to show off your graphics card(s), motherboard and CPU cooler. In order to remove the case door(s), you must unclip the lid at the top of the Raven 2 Evolution and then undo a pair of thumbscrews holding the door in place. The opposite case door is featureless, with nothing except a black paint job. As bland as the left side is, it suits the overall design well as the primary focal point is the top. Flipping the Raven 2 Evolution upside down, we find three massive fan grills that feed large volumes of cool air into the case. 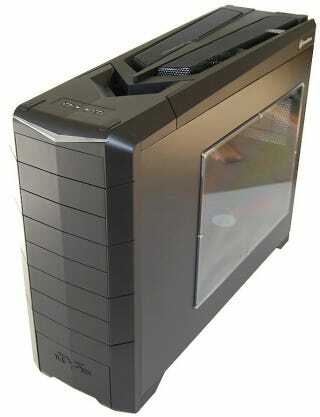 The case has four feet raising it 2.5cm off the ground, and this height is important as it allows enough air to be sucked under the case by the internal fans. Something a little unusual is the pair of half-inch water cooling holes in the bottom of the case. Because the intake fans are located at the bottom of the case, Silverstone has provided these holes to let users mount a radiator underneath the case when using a water-cooling setup. We're not sure how well this would work as the radiator would likely block most of the intake fans' airflow given the limited space underneath the case. Furthermore, the radiator would warm the intake air making the cooling setup far less efficient. Radiators are typically mounted on the exhaust side of the case, so this is something you should be aware of if you want to use a water-cooling setup with the Raven 2 Evolution.